A headteacher who oversaw three disappointing Ofsted inspections in four years is to step down in December. Elizabeth Hayes, who has had the top job at Boldon School, in New Road, Boldon Colliery, since 2008, is due to begin her last term in charge when pupils return to class on Wednesday. From January she will be replaced by current deputy headteacher Ian Noble. Mrs Hayes said: I decided to retire after 35 years working in education, it’s really as simple as that, I’ve had a wonderful career. “I made the decision at the start of 2018 that it would be my last year. “The decision to go at Christmas was based around the idea for a new head to come in in January and put their stamp on things. Parents were first told about Hayes’s intention to retire in May’s newsletter. This came in the same month schools watchdog Ofsted published a monitoring report criticising school leaders for ‘not taking effective action to tackle the areas requiring improvement‘. But Mrs Hayes has insisted this was not a factor in her decision, which she said had been made months before. Full assessments by Ofsted inspectors had previously rated the school ‘Requires Improvement’ in June 2017, May 2015 and May 2013. Before this, the school had been marked ‘Satisfactory’ in July 2010. 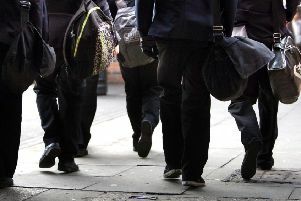 An advert for a new headteacher was placed on the jobs website North East Jobs in May with a salary band of L25-31, which according to the National Association of Schoolmasters Union of Women Teachers (NASUWT) equates to about £71-82,000. Current deputy head Mr Noble will be given the reins until at least the end of the academic year.